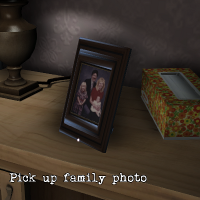 Gone Home pulls in a lot of conceits to make itself work. You’re in your family’s home (so you have context for the people and relationships) but they’ve moved since you’ve been back (so there’s opportunity for exploration). Your sister is writing a diary with you in mind (allowing for voiceover narration) and is going through some pretty intense life drama for a well-off high-schooler (making the story interesting). The house happens to be an old mansion inherited from an eccentric relative (giving plenty of space and architectural oddity), and your family is rather fond of writing notes and leaving stuff in dramatic places (giving you something to read and look at). Sure, there are other game formulas with similar tropes. The military shooter where you are the sole (or nearly sole) survivor of a helicopter crash, receiving in-the-field commands and scavenging for weapons in a conveniently unpopulated ruined city. The wacky graphical adventure where people stand around with their problems and inventory items on full display, waiting for a kleptomaniacal sociopath to walk by and ruin/save their day. The entire neutron-star ouroboros that is the fantasy roleplaying genre. But these are collections of games that lend context and suspension of disbelief to new entries. Gone Home seems more singular. So what can I actually take away from this game? Gone Home‘s closest relatives are probably Myst and its descendants. While Gone Home has very few puzzles, those that it does have fit that mold. Explore an area to figure out what happened there and how things are laid out, then find a code or a key that opens the next area or set of clues. Gone Home provides more intangible rewards than most of those games, but it may have more in common with them than with the “immersive sims” or the first-person horror games that are its immediate creative ancestors. So: environmental storytelling, physical-feeling bits of evidence, emotionally significant locations and objects, settings that engender familiarity, intimate sound design, and a lack of bravado. These are all things to take away from Gone Home. I actually hope we see a bunch of decent games about visiting your brother’s apartment and discovering he’s trans or exploring your parents’ divorce through the boxes in their attic, but I like more universal takeaways from a game. This is a good review; I found that reviewers struggled with this game, so I played it and reviewed it myself and realised why they struggled! The itching ‘sensation of inspiration’ is an interesting one. I felt inspiration to do something ‘artistic’ not necessarily create a similar game, but perhaps write or something.